Synonyms: agreeable, calm, composed, cordial, even, friendly, gregarious, level-headed, lovely, nice, pleasant, poised, sociable, steady, stable (like the right-rope walker who must make constant adjustments to find balance), warm. Over the next week take the time to reread the text on spiritual Libra and to answer the following questions. The answers to these questions and subsequent Spiritual Exercises will form a journal of spiritual self-inquiry. This writing process will deepen your understanding of The Brotherhood of Light Lessons and Hermetic Philosophy as well as provide insights into your own spiritual processes. Over time, you will gain in greater self-discovery and self-realization and have the means of tracking your own process of spiritual maturation. What are your earliest memories of an awareness of fairness or lack of fairness in the world? Can you describe an event? How did this change or impact you? How do you discern what is just and fair in your life? 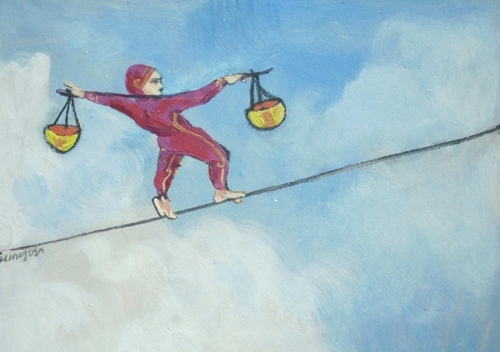 How does being a fair person impact your daily decision making? How do the qualities of peace and justice find expression in your daily life? What do you do? Describe a situation in your life where you positively experienced justice in action? How do you recognize when you are being fair or unfair? What techniques do you use to experience inner peace and harmony in your life? Try and describe a situation in your life where inner peace and harmony was followed by an experience of success and happiness? How do you recognize when you are at peace with the world? What does it feel like? What techniques do you use to enhance more harmonious relationships with others? Where is the sign of Libra in your horoscope? Does it fall on a house cusp? If so, which one? How does Libra impact your thinking in this area of your life? On a scale from 1 – 10 (10 being the highest) how would you rank the importance of peace, harmony and justice to you personally? Do you have any planets in Libra? If so, which planet/s? How does this influence you? Looking at your astrodyne report, what is the power of the sign Libra in your birth chart? What percentage of power does it hold among the 12 signs? 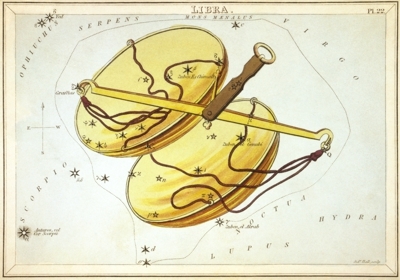 What import life lessons can you learn about the role of Libra in your chart?